A beautiful smile begins with a strong foundation of healthy gums. Early detection and treatment of periodontal disease can help most people to preserve their teeth for a lifetime. Clements Dental offers a comprehensive periodontal disease prevention and treatment program because a solid foundation of healthy gums is essential to protecting your investment in enhancements such as crowns, bridges, partials, veneers, and professional whitening. Gingivitis is the early stages of periodontal disease, when only the soft tissues of the mouth are affected. Plaque buildup leads to tartar and bacteria below the gumline, which leads to inflamed, irritated, or bleeding gums. The good news is that gingivitis is reversible.​​​ A good professional cleaning, followed by regular brushing,flossing, and checkups, restores gums to good health by removing plaque and bacteria. 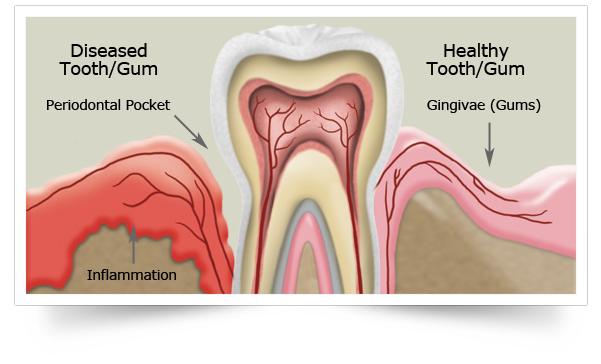 Early stages of gum disease include redness, swelling, or inflammation around the gumline. If these warning signs appear, your dentist will check for calculus (tartar) below the gumline. Your dentist or hygienist may use a tool called a probe to test gums for bleeding and measure periodontal pockets. X-rays will be used to evaluate the bone level around your teeth. Though the main cause of gum disease is lack of oral hygiene, contributing factors include heavy smoking and diabetes.